The spark plugs in your engine are a valuable indication of its health. By the way they look, spark plugs can tell you whether your engine is running too rich, too lean, too hot, too cold, if the ignition is off or if it has worn out. So do pay attention to your plugs once in a while. This can save a lot of headache. Please do not e-mail me about your spark plug problems on a particular car. Unless it's a Triumph Spitfire of course. 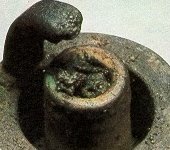 This is how your plugs should look after they've been used for a few miles. Nice, grey-brown deposits, lightly coated core nose. 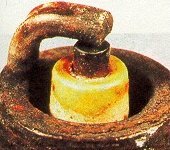 Plugs are ideally suited to engine, engine probably in good condition. Hmmm, lovely! A build-up of heavy, light-grey sandy deposits. 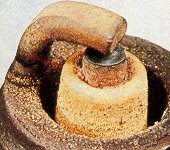 Often caused by worn valve guides, excessive use of upper cylinder lubricant, or idling for long periods. Dry, black, soot-like deposits. Caused by rich running. Check carb mixture settings, float level, choke operation, air filter. 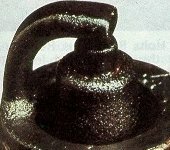 Wet deposits of oil. 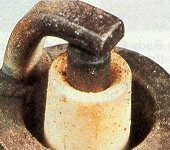 Caused by worn bores, pistong rings or valve guides. Sometimes happens briefly during running-in period. Electrodes look glazed; core nose very white; few deposits. Plug is overheating. Check plug temperature value, ignition timing, fuel octane rating (might be too low) and mixture setting (too lean). 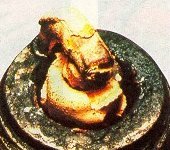 Rectify before piston rings break or valve faces burn. Electrodes have been burned away, core nose has burned, glazed appearance. Pre-ignition. Check ignition timing and plug temperature value. 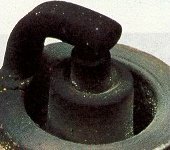 Detonation or wrong way of setting electrode gap. Check ignition timing, cooling system, fuel mixture setting (too lean). Probably doesn't happen with unleaded fuel. 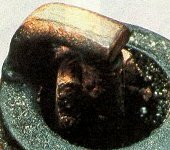 Plug insulator firing tip looks yellow or green/yellow and shiny. Often caused by incorrect carb setting, excessive idling followed by sharp acceleration. Also check timing. Pictures scanned from a Champion spark plugs advert.